Marojevic, V., Gelonch, A.J., Reed, J. 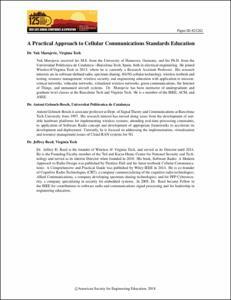 A practical approach to cellular communications standards education. A: ASEE Annual Conference and Exposition. "2018 ASEE Annual Conference & Exposition". American Society for Engineering Education (ASEE), 2018, p. 1-18.